Breakdancing is a wilful and creative style of dance. It’s dance born on the streets where sneakers, are the dance shoes and dynamic gymnastic manoeuvres are the standard moves. Dance, sure, but the top protagonists are supreme athletes. Fitness. Strength. Agility – the top BBoys and BGirls combine all three, but it doesn’t come overnight. 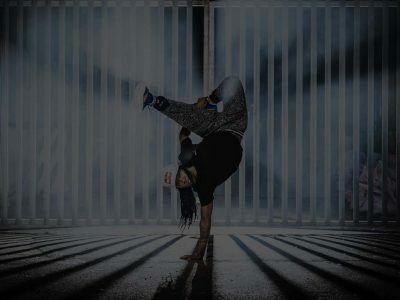 Pioneering SA BBoy Vouks gives us some insight into what it takes to be in the right shape to it to master an inversion, freeze, or headspin; and, to perform these over and over, in perfect form, during a long battle, such as at Red Bull BC One. The veteran b-boy tells us how being innovative & creative with your moves is the key to winning. Being a successful BBoy requires a lot of all-round fitness, right? Indeed it does, being a successful BBoy means being an entertainer and an athlete. It’s body, mind and soul. You always have to be aware and conscious about health and fitness and constantly trying to push yourself and your body to do things people don’t consider normal and perhaps even scary. Does this fitness and conditioning come simply from dancing practice or do you have to do specific training outside of that, say, in the gym? In the beginning it’s all about dance and you’re just excited to discover this awesome talent and genre of dance itself, but once you decide to make it a career path it takes more thought and dedication. From there it morphs into a lifestyle where dance practise, gym and fitness is a must just to stay strong and be able to keep up and be consistent. Then you also have to push yourself to do more, learn more, keep yourself inspired, constantly evolve and improve as a dancer. Some dancers choose to add an additional art form such as gymnastics or different types of karate to keep inspired and agile, developing their own skill and unique staple styles and moves. It really does involve so much more than it seems. Take us through the types of cardio and gym training you would do? Firstly, I try workout first thing in the morning for a short period of time focusing on my cardio and stamina for my dancing, doing mostly jogging/running, different top rocks reps, going into jumping jacks and a set of light weights for my arm strength training. I also do a lot of core work. Then I do another session at night which features more intensity – focusing on conditioning, strength training and a lot of stretching for my muscles to help them heal. I do a lot of super sets and I make sure that I am consistent with my training. Going to gym is not about building muscle or looking a certain way for me, it is apart of my craft I have no choice, it is very important for me to be strong, healthy and fit. The core work is where I get all my strength from when I dance. The super sets are to stay fit, keep stamina and to look effortless when I dance and train my joints for more mobility and agility. The cardio is for health and to keep my heart rate up everyday and to keep up with high intensive performance levels. A competition such as Red Bull BC ONE can be won or lost purely on fitness, right? That is an absolute fact! Your fitness plays a huge role in your dancing. Once you get tired you dance slower make more mistakes and you become winded and sloppy your opponent and judges pick that up sometimes even before you do. You have to focus on fitness as well as to be conscious and aware of your breathing during events that feature many battles. What type of training would you recommend for someone just starting out as a BBoy or BGirl? A lot of push ups and hand stands so you can become comfortable with your own bodyweight and build arm and core strength. Don’t smoke, don’t drink or abuse any type of substance such as drugs. Educate yourself on health and fitness and find other ways to develop your skills, like taking up a gymnastics class, keep yourself inspired, learn as much as you possibly can and most importantly listen to your body! WORK HARD… STAY HUMBLE.